Head injury is an injury to the scalp, skull, or brain. The most important consequence of head trauma is traumatic brain injury. Head injury may occur either as a closed head injury, such as the head hitting a car's windshield; or as a penetrating head injury, as when a bullet pierces the skull. Both may cause damage that ranges from mild to profound. Very severe injury can be fatal because of profound brain damage. Injuries to the head can be caused by traffic accidents, sports injuries , falls, workplace accidents, assaults, or bullets. Most people have had some type of head injury at least once in their lives, but rarely do they require a hospital visit. Each year about two million people suffer from a more serious head injury, and up to 750,000 of those are severe enough to require hospitalization . Brain injury is most likely to occur in males between ages 15 and 24, usually as a result of car and motorcycle accidents. About 70 percent of all accidental deaths are due to head injuries, as are most of the disabilities that occur after trauma. Among children and infants, head injury is the most common cause of death and disability. The most common cause of head injury in children under age two is child abuse . After a head injury, there may be a period of impaired consciousness followed by a period of confusion and impaired memory with disorientation and a breakdown in the ability to store and retrieve new information. Others experience temporary amnesia following head injury that begins with memory loss over a period of weeks, months, or years before the injury (retrograde amnesia). As a person recovers, memory slowly returns. Post-traumatic amnesia refers to loss of memory for events during and after the accident. Epilepsy occurs in 2–5 percent of those who have had a head injury; it is much more common in people who have had severe or penetrating injuries. Most cases of epilepsy appear right after the accident or within the first year and become less likely with increased time following the accident. Closed head injury refers to brain injury without any penetrating injury to the brain. It may be the result of a direct blow to the head; of the moving head being rapidly stopped, such as when a person's head hits a windshield in a car accident; or by the sudden deceleration of the head without its striking another object. The kind of injury the brain receives in a closed head injury is determined by whether the head was unrestrained upon impact and the direction, force, and velocity of the blow. If the head is resting on impact, the maximum damage will be found at the impact site. A moving head will cause a contrecoup injury where the brain damage occurs on the side opposite the point of impact, as a result of the brain slamming into that side of the skull. A closed head injury also may occur without the head being struck, such as when a person experiences whiplash. This type of injury occurs because the brain is of a different density than the skull and can be injured when delicate brain tissues hit against the rough, jagged inner surface of the skull. Bleeding (hemorrhage) inside the skull may accompany a head injury and cause additional damage to the brain. A blood clot (hematoma) may occur if a blood vessel between the skull and the brain ruptures; when the blood leaks out and forms a clot, it can press against brain tissue, causing symptoms from a few hours to a few weeks after the injury. If the clot is located between the bones of the skull and the covering of the brain (dura), it is called an epidural hematoma. If the clot is between the dura and the brain tissue itself, the condition is called a subdural hematoma . In other cases, bleeding may occur deeper inside the brain. This condition is called intracerebral hemorrhage or intracerebral contusion (from the word for bruising). If the head injury is mild, there may be no symptoms other than a slight headache. There also may be confusion, dizziness, and blurred vision. While the head injury may seem to have been quite mild, in many cases symptoms persist for days or weeks. Up to 60 percent of persons who sustain a mild brain injury continue to experience a range of symptoms called postconcussion syndrome as long as six months or a year after the injury. 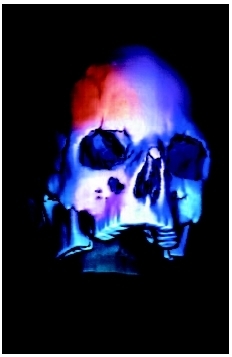 A three-dimensional computed tomography (CT) scan of a human skull showing a depressed skull fracture above the right eye. Doctors use the Glasgow Coma Scale to evaluate the extent of brain damage based on observing a person's ability to open his or her eyes, respond verbally, and respond to stimulation by moving (motor response). People can score from three to 15 points on this scale. People who score below eight when they are admitted usually have suffered a severe brain injury and will need rehabilitative therapy as they recover. In general, higher scores on the Glasgow Coma Scale indicate less severe brain injury and a better prognosis for recovery. Individuals with a mild head injury who experience symptoms are advised to seek out the care of a specialist; unless a family physician is thoroughly familiar with medical literature in this area, experts warn that there is a good chance that people's complaints after a mild head injury will be downplayed or dismissed. In the case of mild head injury or postconcussion syndrome, CT and MRI scans, electroencephalograms (EEG), and routine neurological evaluations all may be normal because the damage is so subtle. In many cases, these tests cannot detect the microscopic damage that occurs when fibers are stretched in a mild, diffuse injury. In this type of injury, the axons lose some of their covering and become less efficient. This mild injury to the white matter reduces the quality of communication between different parts or the brain. A PET scan, which evaluates cerebral blood flow and brain metabolism, may be of help in diagnosing mild head injury. Persons with continuing symptoms after a mild head injury should call a local chapter of a head-injury foundation that can refer people to the best nearby expert. If a concussion, bleeding inside the skull, or skull fracture is suspected, the person should be kept quiet in a darkened room, with head and shoulders raised slightly on pillow or blanket. After initial emergency treatment, a team of specialists may be needed to evaluate and treat the problems that result. A penetrating wound may require surgery. Those with severe injuries or with a deteriorating level of consciousness may be kept hospitalized for observation. If there is bleeding inside the skull, the blood may need to be surgically drained; if a clot has formed, it may need to be removed. Severe skull fractures also require surgery. Supportive care and specific treatments may be required if the person experiences further complications. People who experience seizures, for example, may be given anticonvulsant drugs, and people who develop fluid on the brain ( hydrocephalus ) may have a shunt inserted to drain the fluid. Prompt, proper diagnosis and treatment can help alleviate some of the problems that may develop after a head injury. However, it usually is difficult to predict the outcome of a brain injury in the first few hours or days; a person's prognosis may not be known for many months or even years. The outlook for someone with a minor head injury generally is good, although recovery may be delayed, and symptoms such as headache, dizziness, and cognitive problems can persist for up to a year or longer after an accident. This can limit a person's ability to work and cause strain in personal relationships. As researchers learn more about the long-term effects of head injuries, they uncover links to later conditions. A 2003 report found that mild brain injury during childhood could speed up expression of schizophrenia in those who were already likely to get the disorder because of genetics. Those with a history of a childhood brain injury, even a minor one, were more likely to get familial schizophrenia than a sibling and to have earlier onset. Another study in 2003 found that people who had a history of a severe head injury were four times more likely to develop Parkinson's disease than the average population. Those requiring hospitalization for their head injuries were 11 times as likely. The risk did not increase for people receiving mild head injuries. Many severe head injuries could be prevented by wearing protective helmets during certain sports and when riding a bike or motorcycle. Seat belts and airbags can prevent many head injuries that result from car accidents. Appropriate protective headgear always should be worn on the job where head injuries are a possibility. Parents should insist that their children always use a seat belt when riding in a car. They should also insist that appropriate protective headgear always be worn when children engage in activities such as bicycling or rollerblading during which a head injury is possible. If a parent suspects a caregiver of abusing their child, prompt intervention is required. Hergenroeder, Albert C., and Joseph N. Chorley. "Head and Neck Injuries." In Nelson Textbook of Pediatrics , 17th ed. Edited by Richard E. Behrman et al. Philadelphia: Saunders, 2003, pp. 2313–4. Hodge, Charles J. "Head Injury." In Cecil Textbook of Medicine , 22nd ed. Edited by Lee Goldman et al. Philadelphia: Saunders, 2003, pp. 2241–2. Ropper, Allan H. "Traumatic Injuries of the Head and Spine." In Harrison's Principles of Internal Medicine , 15th ed. Edited by Eugene Braunwald et al. New York: McGraw-Hill, 2001, pp. 2434–41. Saunders, Charles E., et al. Current Emergency Diagnosis and Treatment. New York: McGraw-Hill, 2003. Hrysomallis, C. "Impact energy attenuation of protective football headgear against a yielding surface." Journal of Science and Medicine in Sport 7, no. 2 (2004): 156–64. Stern, B., et al. "Profiles of patients with a history of mild head injury." International Journal of Neuroscience 114, no. 9 (2004): 1223–37. Stocchetti, N., et al. "Inaccurate early assessment of neurological severity in head injury." Journal of Neurotrauma 21, no. 9 (2004): 1131–40. International Brain Injury Association. 1150 South Washington St., Suite 210, Alexandria, VA 22314. Web site: http://www.internationalbrain.org/. Cyr, Dawna L., and Steven B. Johnson. "First Aid for Head Injuries." University of Maine Cooperative Extension. Available online at http://www.cdc.gov/nasd/docs/d000801-d000900/d000815/d000815.html (accessed January 6, 2005). "Head and Brain Injuries." MedlinePlus. Available online at http://www.nlm.nih.gov/medlineplus/headandbraininjuries.html (accessed January 6, 2005). "Head Injuries: What to Watch for Afterward." American Academy of Family Physicians. Available online at http://familydoctor.org/x4958.xml (accessed January 6, 2005). "Head Injury." Institute for Neurology and Neurosurgery. Available online at http://nyneurosurgery.org/head_intro.htm (accessed January 6, 2005). "The Management of Minor Closed Head Injury in Children (AC9858)." American Academy of Pediatrics. Available online at http://www.aap.org/policy/ac9858.html (accessed January 6, 2005).